iOS Versions Supported by Device and Other Goodies. I had been meaning, for quite some time, to create a spreadsheet or graphic cross-referencing the various iOS devices and the OS version they support. 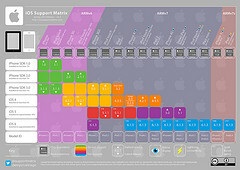 By sheer happenstance, the other day, I discovered the iOS Support Matrix (see www.iosupportmatrix.com). They have created a great info-graphic that summarizes this and a bunch of other information at a glance. The graphic is free to download and available in a variety of sizes and formats.